Fully automatic 8 station intermittent rotary preformed bag dispensing, opening and closing machine combined with automatic multiheads combination weigh scale fller, overhead work platform and z-elevator bulk feeder. Safety guard protected for high speed and consistent production. Heavy duty components and parts are selected for machine durability hygienic construction and easy cleaning (wash down construction on special request). Operators friendly design touch-screen control system, versatile in design, easy to link up with other down stream packaging equipment such as liquid filler, multiheads weigher, metal detector, checkweigher, case sealer etc. Innovative and practical solution at reasonable costs. Candy, peanut, green bean, pistachio, crystal candy, brow sugar, cookie, daily commodities, cooled food, pickles, puffed food, grain, refined monosodium glutamate, granular drug, capsule, seed, condiment granulated sugar, chicken essence, melon seeds, nuts, pesticide, fertilizer, feed etc. 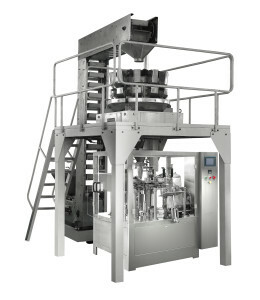 depending on type dosing system selected. Bag Type All Type Of Heat Sealable Preformed Side Seal Bags, Fin Seal Bags, Gusseted Bags, Block Bottom Bags, Zip-Lock Recloseable Bags, Stand-Up Pouch With Our Without Spout Etc. Application Candy, biscuit, peanut, cookies, pistachio, crystal candy, brown sugar, daily commodities, cooked food, pickles, puffed food etc. 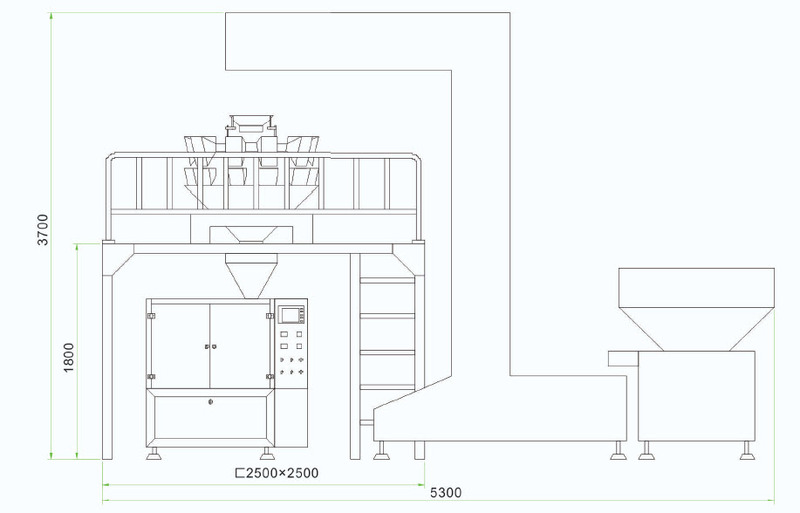 Optional Equipment Dosing assembly, materials bulk feed system, special down stream attachments etc.